Ruby the Airedale: No Tricks, Just Treats for Shelters! Totally agree that those who rescue pups and cats and other animals are the heroes! You and your Mom are both superheroes to do all those fabulous things for the benefit of the shelter!!! That was so kind!!! Wahoo!! Go Ruby, what great gals you and your Mama are!! That is a very super hero thing to do!! Way to go, Ruby!! Looking fab! Great job, darling! Hooray to you and your Ma! The kitties and puppies at the shelter are gonna be nice and warm with full bellies tonight! And you look adorable in your pink cape! Squeee! You are the cutest superhero ever! Thanks for taking care of the less fortunate pups. Yup, F.A.R. 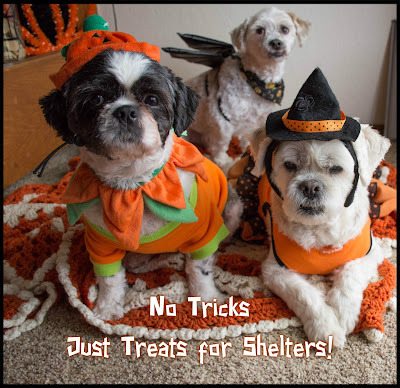 (Foothills Animal Rescue). Aww I love that you're a superhero. aww ruby, what a super thing to do. you are a super pup! You are a true superhero Ruby and so is your mum! Bet those shelter pups are so grateful. That's not a costume...you really are a superhero, like Elliot and Cricket said! It sure does make you feel good to donate to a shelter or rescue group. You make a great super dog in that costume. Ruby WTG gurllllllllll we know the shelter was tickled nearly as pink as your super duper costume!! I love love it!! We love your Supergirl coat Ruby! That's a great idea. We always take old towels and stuff to the shelter. Your True Love Stud Muffin & Tick Tack! My Peeps donate all sorts of things to a certain, local Resale Store. This particular one gives all proceeds to a nearby animal rescue group. It makes both Kali and Me happy as we are both rescues. We do the same thing Ruby! They need all the help they can get! Love that superhero cape! Mom keeps a box in the laundry room that she fills with goodies for the shelter. Our mom made a similar donation to our shelter! She made Dad go with her so she wouldn't come home with anyone -- if you know what I mean! Wow, you surely are one gorgeous super hero gal! Great job helping out the other less fortunate pooches. What a sweet way to celebrate and support a shelter. *You* and your *mom* are superheroes - no doubt about it. We love you, Ruby!